The Blueberry Bluegrass Concert in the Park will take place Friday, June 8, at Festival Park in Nacogdoches. The concert is free and open to the public. Several food vendors will be on site, and restrooms will be available. Volunteers with golf carts will assist those with mobility challenges getting from the parking lot to the concert seating area. This is a family-friendly event, and no alcohol or coolers are allowed. Concert-goers should bring blankets or lawn chairs for seating. Information regarding performances will be posted soon. 1. Parking closest to the Festival Park concert venue is at the Nacogdoches City Garage, at 114 W. Cox St. There is plenty of parking here. From West Main Street, turn south on Bremond Street, across from Lone Star Farm & Home Store. Then turn left on West Cox Street and look for volunteers directing you where to park. 2. 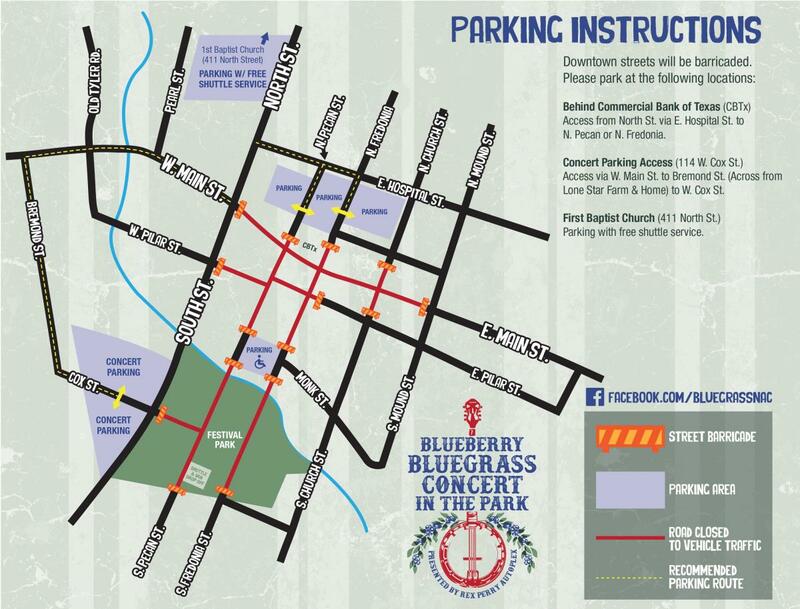 Remote parking with free shuttle bus service to the concert venue is at First Baptist Church, 411 North St. Parking is courtesy of First Baptist Church and the SFA Shuttle Buses are arranged in partnership with the SFA Alumni Association.